What a great way to share the great Clear Scraps products with that crafty friend. It's a fast and easy way to solve your gift giving problems. Gift Certificate will either be emailed or mailed as you desire. Pack of 3 - 1/2" Clear post extensions. Fits Clear Scraps top load albums. Bag of 100 1" Chrome Rings. Add a little Staz On to color your ring for added creativity! Bag of 100 1 1/4" Chrome Rings. Add a little Staz On to color your ring for added creativity! 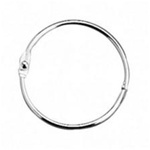 Bag of 100 1 1/2" Chrome Rings. Add a little Staz On to color your ring for added creativity! Bag of 100 2" Chrome Rings. Add a little Staz On to color your ring for added creativity!